Agro-Tourism could save the environment and Eco-Tourism is destroying the ecological systems of the world. A good Eco-Tourist stays at home; otherwise, they build a Hotel on top of the Eco-Systems they think they are saving. I really am confused, probably angry, about how my fellow tourist can be, addle brained or lacking in curiosity about food. The will spend an unbelievable amount of money searching for a restaurant. However, there seems to be ZERO interest in the growing of food or where the food in the restaurant came from. North of Machala and around Guayaquil in the plains of valley below the Andes in Ecuador is in my opinion one of the most fertile and interesting crop areas on the planet. Tropical weather creates for the mass growing of Cocoa, Bananas, and Sugar cane, I am told coffee, however I did not see any coffee. The land is flat, plenty of water and it looks like crops grow in abundance. I am angry think about this because there is no tourism force that helps people to visit these plantations. In Costa Rica, volunteers go and work in Coffee Fincas and free labor competes with the locals. Silly behavior is everywhere, tourist mean well, however will do or purchase anything put in front of them. I would love to figure out an easy way to go visit these plantations. I pass them in buses and look out the window, trying to figure out a way to respectfully enter a plantation and look around. The only solution I can figure out is to go to small village, stay, hire a taxi to go and visit a plantation. I almost need a truck or car to do this correctly. Taxi drivers are not so honest on the planet and can cause many problems. They constantly try to maneuver either me or the maybe the owner, I will think about this. 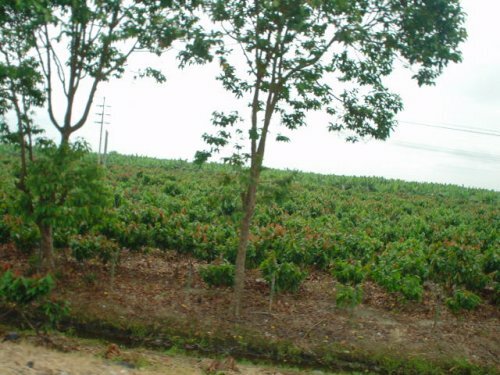 I am considering leaving this morning for a city outside of Machala, my thought was that Machala was a small city and there would be a meeting of the plantations with the ocean. Machala is a very large city, they say around 200,000 people, and however my guess is more around 500,000 and too big to get close to anything but the city. Machala is an excellent cultural city, full of diverse combinations of groups, or types of cultures. The markets are an interesting dirty mess full of many types of vegetables and crops of the area. Many lemons, and then there is the shrimps, it appears that on the way to Jamila or the area of Jamila is really more of a Shrimp farm area, then a resort area, the whole area smells of fish and my stomach is not good with the fish smells. 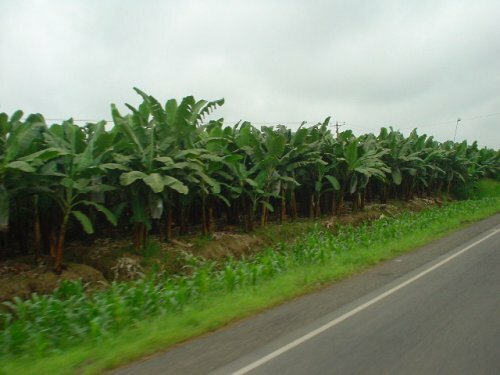 I will need to sort this out, I have been through this area before and feel remorse I have never seen a Banana Plantation up close, I am tired of looking at bananas from the bus window. 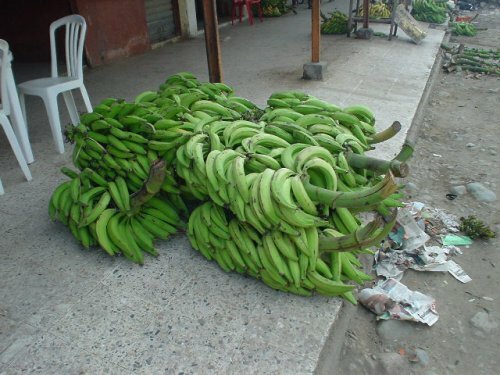 These are Platanos and not really Bananas, a Banana is smaller, the Platanos is more or less the staple type Banana that is used for cooking and such. A banana here is normally smaller and many varieties. Bananas field at taken from the window of my bus. Coco or Cacao the bean for Chocolate. 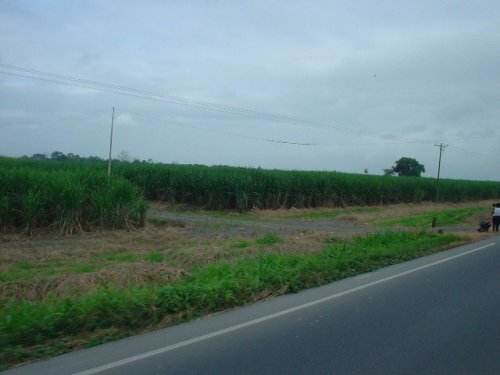 Sugarcane or Cano de Azucar. The process of processing sugar or panela is interesting.